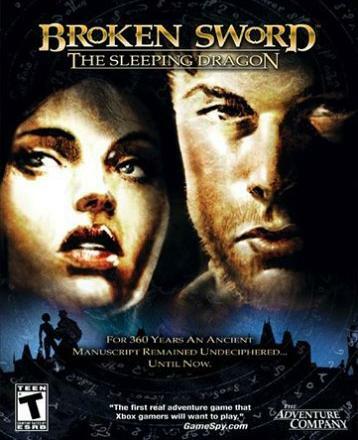 Broken Sword: The Sleeping Dragon is apparently the third installment of the Broken Sword series. I have never played the other games, so this was a fresh start for me. The Sleeping Dragon is an adventure game, but in a fully rendered 3d world. In general I thought it was a good game. It kept pulling me in and I ended up finishing it, so that is a really good sign. Being an adventure game, I want to compare it to other adventure games I’ve played but I really can’t. It doesn’t compare at all to the complex word play of the old text adventures. And I’ve really never played any graphical adventures before this one. I generally liked the interaction of objects and the environment. The game has 4 buttons that represent actions you can do. When you see an object you can interact with, a little star-burst is drawn on it in the game. You can then see what you can do with it directly by little icons shown in the corner. You can bring up you inventory and scroll through your items and the icons change to represent what you can do with each item in the inventory. There is also a way to take an item in the inventory and use it to operate on another object in the inventory. That is about as complex as the actions get—not very complex at all. However, this simplicity doesn’t end up making the game too shallow. The game also has some scripted event action sequences where you are watching a cut-scene and one of the corner icons will flash indicating you should hit that button. It you don’t press it quick enough, you die and the scene replays itself. This adds a little to the game, and usually the repeats are short enough that it doesn’t annoy you too much when you have to watch the scene 3 times due to your slow fingers. Which brings me to a point—this game relies a lot on cut-scenes to keep the story line going. Sometimes I thought they came a little too often. All of them (until the very end) are done using the game engine which is a huge plus in my opinion (I just hate pre-rendered full motion video cut-scenes). If you cannot stand cut-scenes at all, you probably wont like this game too much. Another problem I had with it was that there were way too many box pushing puzzles. These were somewhat interesting the first time I saw them back playing Dungeon (which predates Zork! ), and some of them were interesting. However, as the game progresses they just keep occurring and it gets frustrating because they get more and more complex. I don’t mind the complexity but, given how long the character takes to move a box around and many moves you have to make in the later puzzles, it gets very tedious. Generally the puzzles’ solutions made sense. There were no really off the wall non sequiter solutions. Or at least very very few. I think I got stuck only once or twice—resorting to a walk-though in order to resume progress. The one thing that pleasantly surprised me was that the game was genuinely funny. There are 2 main characters, George (from Idaho) and Nico (from France). They generally had good banter in their dialog. The main humor I am thinking of though is the little quips that each character says as you move them around and try to manipulate things. There are so many games that try to make their characters say little sarcastic things and they usually come off sounding pathetic and not funny at all—if I tell you the main guy says all kinds of wisecracks about the situations he’s in, I know you are going to roll your eyes. All games that have tried this have sucked at it, right? (Well, maybe Duke Nukem 3D did alright, but it was only funny because it was so bad and over the top). This game is different, and I can not put my finger on it. It was just funny. I never fell off my chair or anything, but the deadpan delivery of their little comments always made me smile. The actual movement was a little wonky. It was designed for consoles and so there is no mouse support which is a shame. The arrows try to act like the analog stick should but it ends up being fussy and hard to control sometimes. Generally this isn’t an issue because of the pace of the gameplay, but it does matter in a couple places where movement is timed and at the very end where there’s a slightly out of place action sequence. I also have to note that after you pass you are show the credits accompanied by the most... inappropriate music... ever! It sounded like the end of some cheesy blockbuster action movie and didn’t fit in with the rest of the soundtrack in the slightest. The soundtrack was actually not bad, using orchestral music when you solved puzzles and during the cut scenes. The credits music was some rock song and it just didn’t fit at all. Another complaint is the massively intrusive copy protection that they put on the game. I was severely put out by the game wanting to install some stupid driver that made me reboot my system just so they could use some annoying paranoid copy protection code. This, of course, means you have to put in the stupid CD every time you want to play the game. Argh. Not to mention the couple times when the copy protection said the CD was bad (even though I hadn’t even removed it from the CD-ROM drive since I last played)—Plus it took at least a minute to time out when it thought it was bad. I’m sitting around wasting my time waiting for some %$#@! copy-protection. People who put this kind of copy protection on their game deserve to have it proliferated around the internet. I was this close to downloading a crack just so I didn’t have to install their asinine driver. The bastards. Overall I felt this was a strong game. It is certainly different from your everyday shooter/platformer. It has its faults, but it also has many strengths.